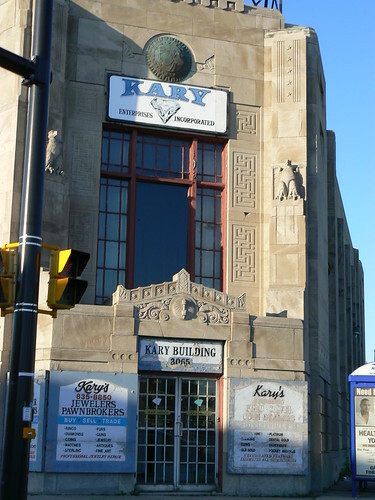 It is kind of appropriate that a pawn shop, Kary Jewelers Pawn Brokers, occupy an old Art Deco building and have even taken it for their own tagging it as the Kary Building. 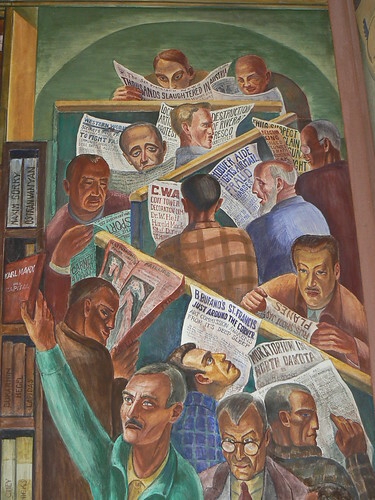 During the Great Depression, the Public Works Art Project (PWAP), part of the US Federal Goverment New Deal program, led to the creation of a wonderful set of murals in Coit Tower. 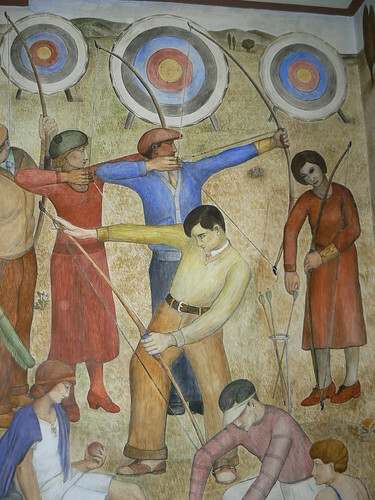 Bernard Zakheim oversaw the project that included over two dozen artits and muralists. 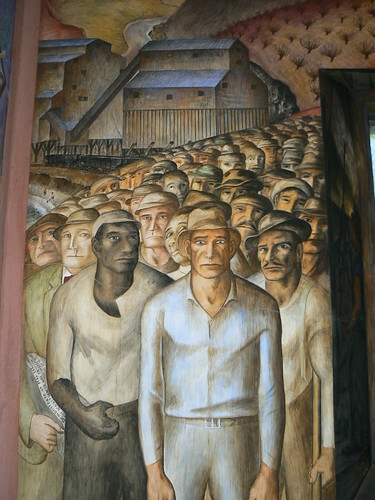 The murals depict aspects of California and San Francisco life during the 1930s and were very controversial at the time, with the inspiration of Diego Rivera is plainly visible in many of them. 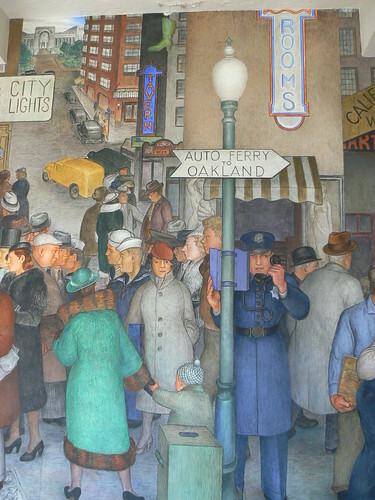 'City Life' by Victor Mikhail Arnautoff is one of the more detailled murals showing many aspects of San Francisco life and city landmarks. 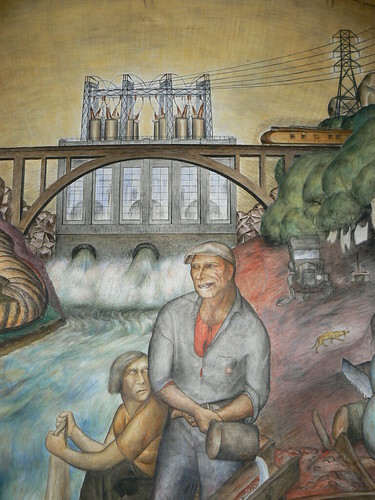 'California Agriculture' by Maxine Albro sits alongside Arnautoff's city view. 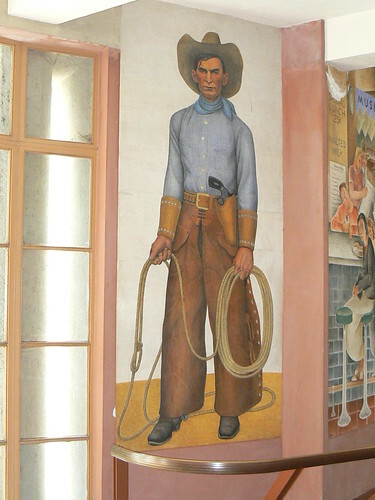 Clifford Wight painted four large figures of a cowboy, farmer, steelworker and surveyor, titled, 'Leaders of California Life'. 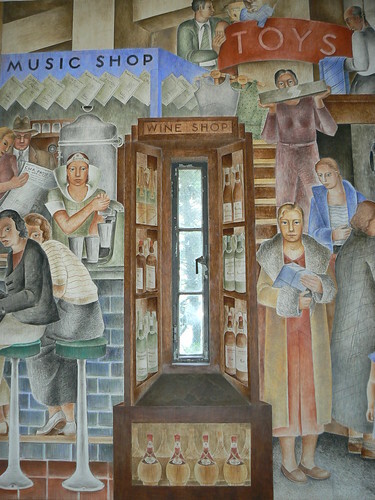 Commerce is represented with this mural showing a selection of shops. 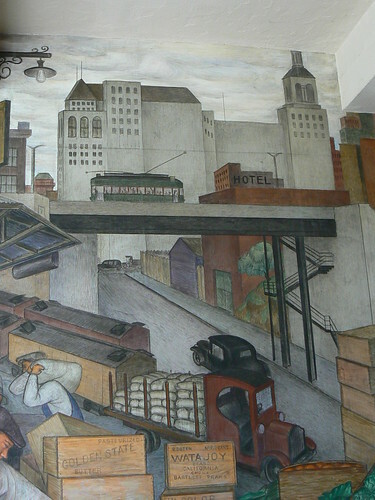 This image also showshow many of the muralists incorporated the features of the tower into their works. In case, like the 'Library' previously incorporates the tower's narrow windows. 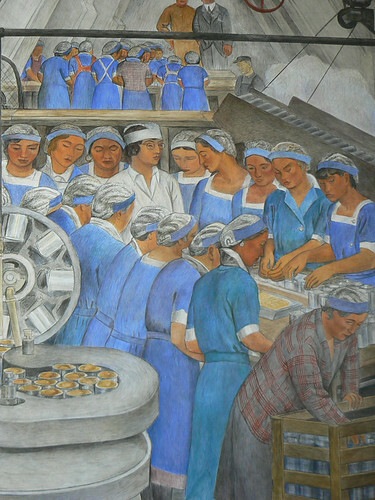 Industry is represented by Ralph Stackpole's 'Industries of California' and John Langley Howard's 'California Industrial Scenes'. 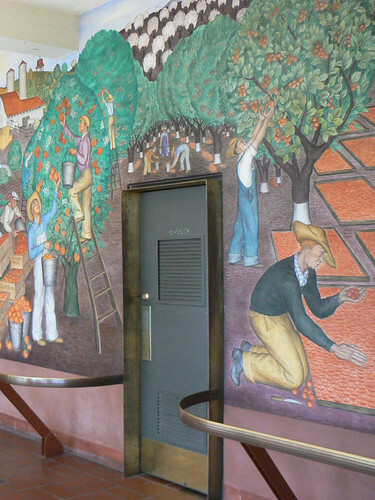 Our tour, by San Francisco City Guides included the murals on the second floor and in the stairwell that are not otherwise accessible by the general public. 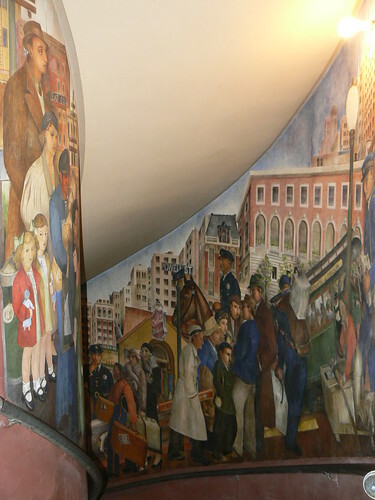 The stairwell features Lucien Labaudt's 'Powell St' showing the scene around the cable car that all visitors to San Francisco will be familiar with. 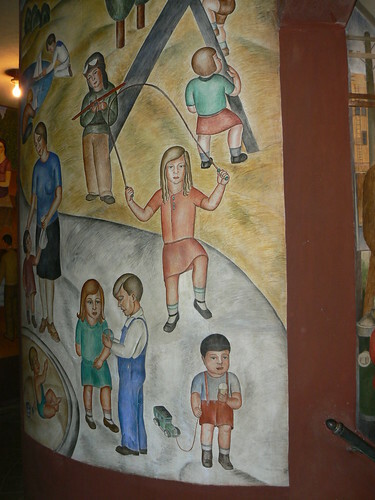 At the top of the stairs, Edward Terada depicts 'Sports' and 'Children at Play'. 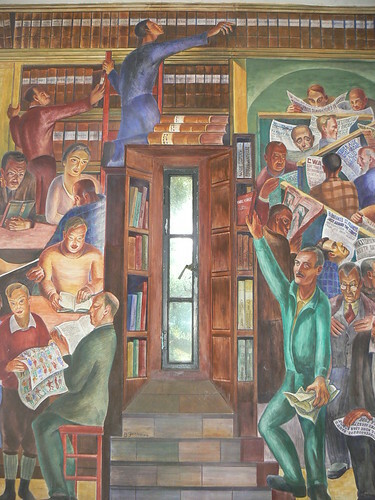 A small room on the second floor presents Coit Tower's perhaps most enigmatic murals. 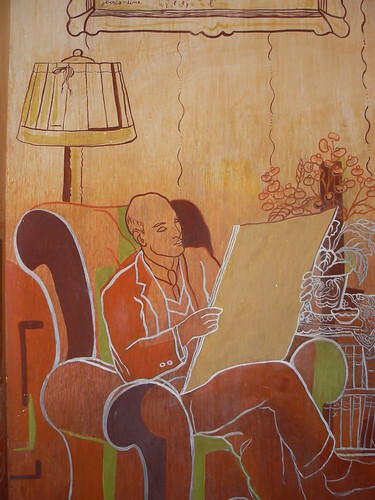 'Home Life' by Jane Berlandina offers a starkly different style to the other murals representing domestic life in the 30's. 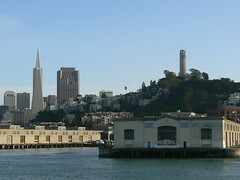 Coit Tower, on the right of this view of San Francisco, was built using money from the bequest of Lillie Hitchcock Coit who left $120,000 to the City of San Francisco on her death in 1929. 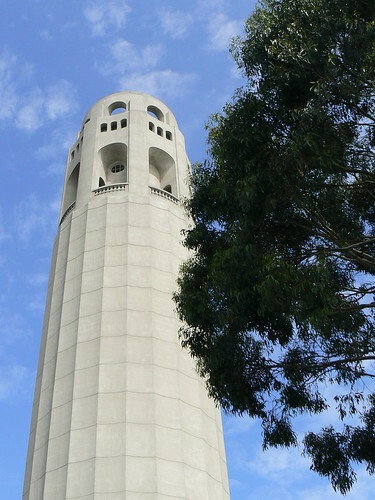 Sitting on Telegraph Hill the design for the 64m Art Deco tower came from Henry Howard of the architectural firm of Arthur Brown Jr. 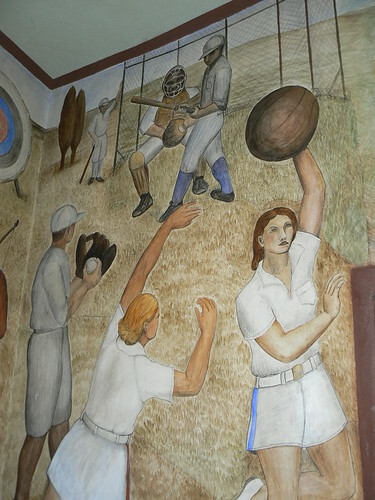 The interior spaces are decorated by over two dozen muralists. 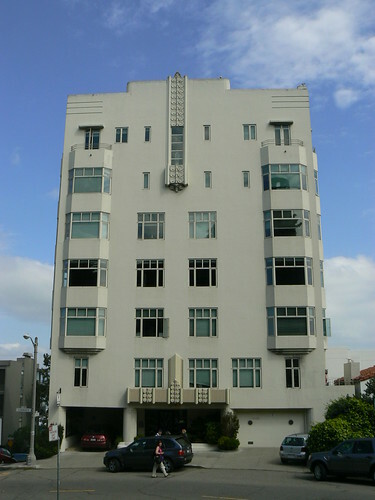 This Art Deco apartment block is on Telegraph Hill in San Francisco. 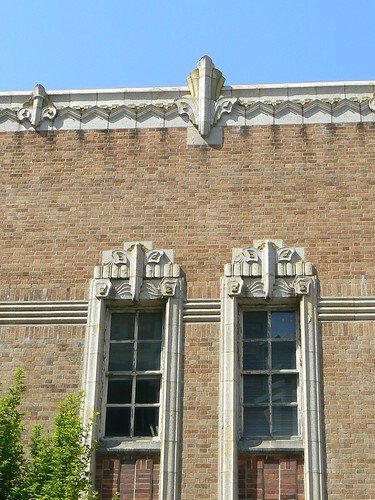 They have typical stylised floral decoration on the canopy above the entrance and in a vertical panel at the top of the facade breaking through the roofline. The bay windows provide an interesting angular dimension. 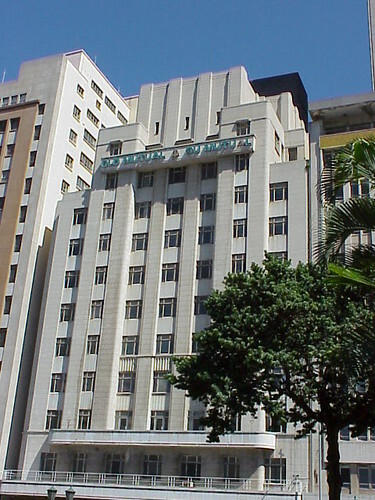 While nowhere as grand as the former Old Mutual headquarters in Cape Town, the Old Mutual building in Durban has a certain substance and style to it. 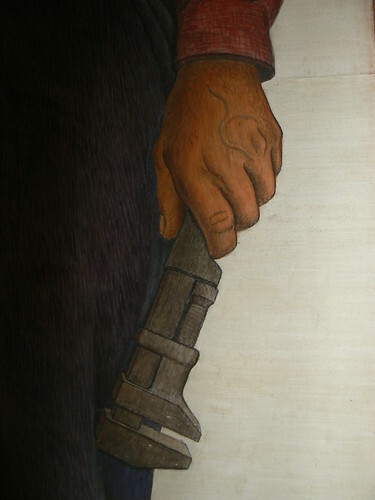 I photographed it in 2003 and I haven't been able to find out much about it. 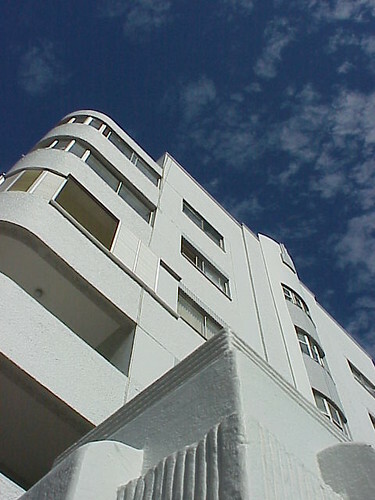 Emporis.com lists a postmodern skyscraper as the Old Mutual Centre in Durban and one of the photos on their site shows this older building sitting in the shadows of the skyscraper. A more concerning report, however, on realestateweb.com.za from November 2009 details the refurbishment of Mutual Mall including this paragraph. The four previous structures included the magnificent 31-storey A-grade tenanted office block, Old Mutual Centre; 300 Smith Street, which is an economical 18-storey office block which has undergone an upgrade to an A-grade building; and Gardiner House and Mutual Building which were demolished to create additional parking - about 400 additional bays resulted in a total of 800 bays (3 per 100m²). I don't know for sure but this doesn't read well for the Old Mutual buildng in my photo. 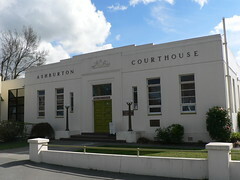 This is the courthouse in Ashburton near Christchurch on the South Island of new Zealand. 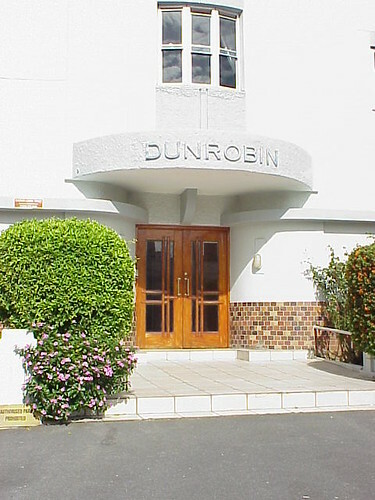 It is a very plain building with modest decoration including a stepped roofline, free-standing lamps on either side of the entrance and a low wall with a metal railing. A plaque honouring the opening of the courthouse on 3rd May 1938 lists Government Architect, J T Mair, as the designer. 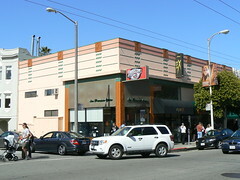 It is always a great thrill to find a deco-era S H Kress & Co store especially in good condition. This store is in Berkeley, CA and is in wonderful condition. Although the colours on the terra cotta decoration may be fading the majority of the decoration is still intact. 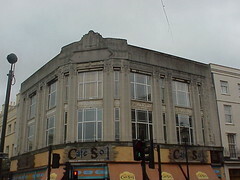 This store was designed by Edward Frederick Sibbert, Jr and opened on 23rd January 1934. 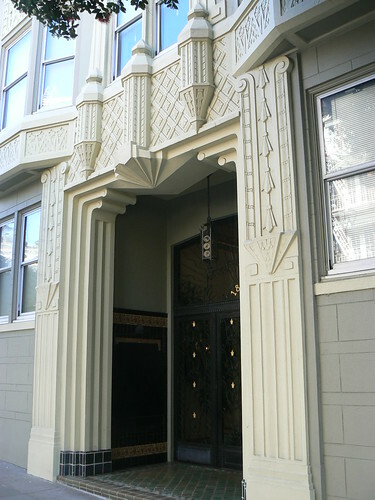 The entrance to 1850 Gough St in Pacific Heights, San Francisco. 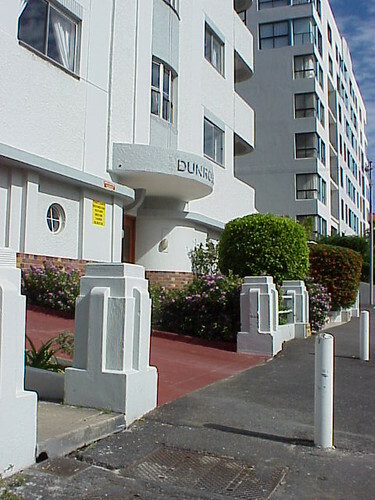 This apartment block was designed by L O Ebbetts and built in 1931. 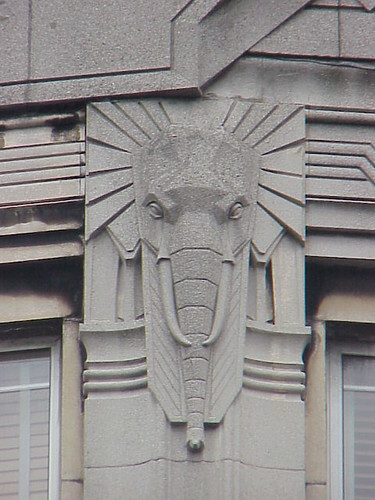 A while back I wrote about Burton's Deco Elephants including photos of elephants on former Burton's stores in Belfast and Streatham with links to other examples from around the UK. In that post I mentioned seeing the elephants on a building in Greenwich and today I came across my photos of it. As you can see it now the Cafe Sol, or at least it was when I took the photos, but it has a lot of the usual Burton's decoration. 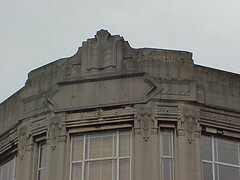 As with other former Burton's buildings, there is an empty cartouche that would have presumably enclosed the Burton name during the store's operation. There is also thin horizontal banding with zig-zag mitofs at regular intervals and, of course, the elephants heads on the column capitals. And as I identified in my previous piece the tusks on these elephants (and other across England) are turned inwards where the Belfast elephants have tusks that are turned outwards. 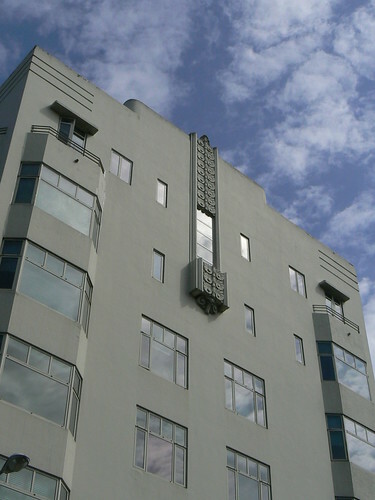 The John Breuner Company Furniture Store which includes many Art Deco elements was designed by Albert Roller in 1931. 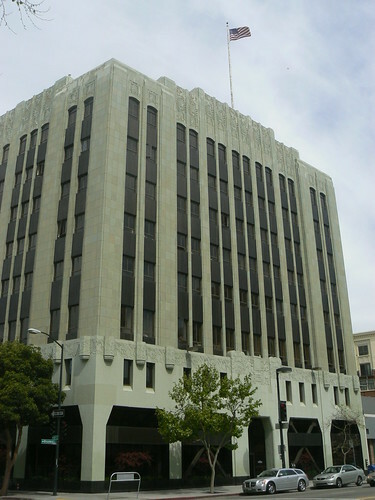 The building is clad in a very light green terra cotta referred to as 'sea-glass'. 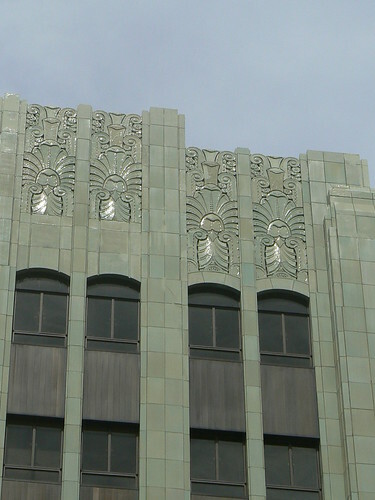 The decoration at the roofline consists of Art Deco panels of stylised floral forms. Originally a large 'Breuners' sign adorned the roof but now there is a single flagpole. At the first floor level a narrow band of similar decoration is punctuated by cylindrical shapes. 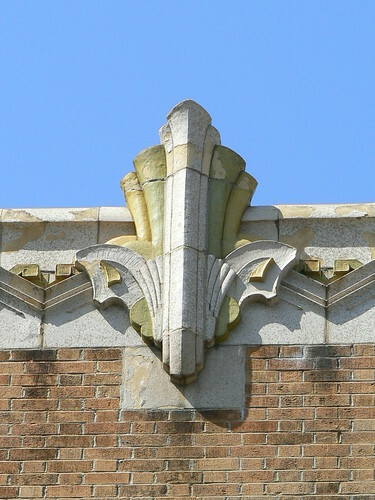 The pinnacle of decoration is above the main doorway where the Bruener Company's trade to protrayed by two men building a chair. 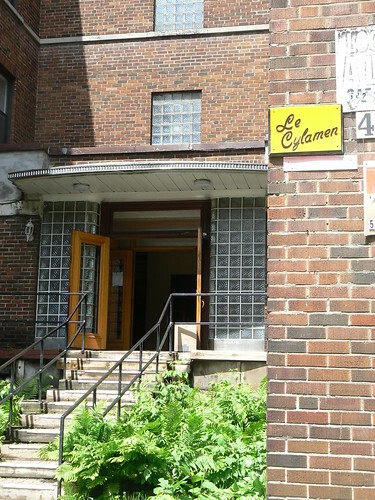 This is an apartment block called Le Cylamen on Chemin Queen Mary in Montreal. The entrance is set back from the street with the two wings of the building providing a somewhat more private space. The door itself is flanked by walls of glass blocks. Each floor is marked against the dark brick by a thin band of concrete decoration. Each floor also has its own glass block window probably to provide light for the stairwell. 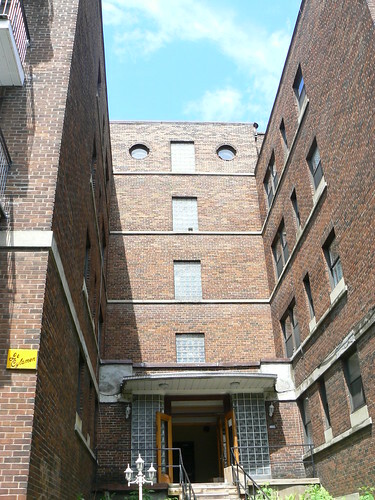 The top floor has two porthole windows. Stopping off in Williams, Az on the original Route 66 was a wonderful journey back to what roadtrips were like prior to the need to rush from one place to another along non-descript intertate highways. The town, even on a unseasonably cold and wet Tuesday, was lively and interesting. 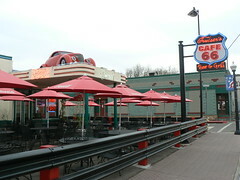 Cruiser's Cafe 66 immediately grabbed my attention. 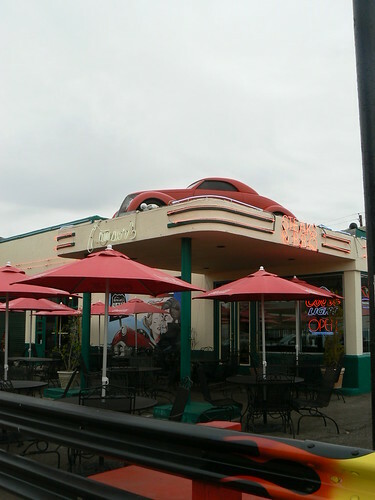 The car on the roof of the canopy helped but behind the tables and umbrellas this was obviously a former streamline service station, or gas station if you prefer. The speedlines are now picked out in red neon but the basic structure building is still there and it is a lovely thing to see after the homogeneous architecture of today's chains along I-40. 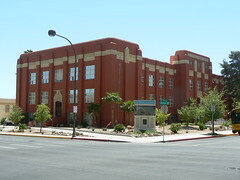 The Las Vegas Academy of International Studies, Performing & Visual Arts was formed in the early 1990s at the former Las Vegas High School when a new LVHS campus was established in another part of Las Vegas at East Sahara & Hollywood. 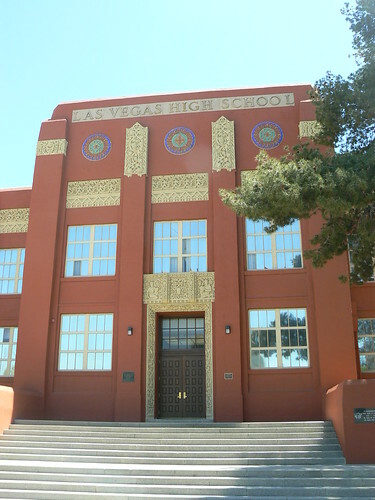 The old Las Vegas High School was built in Art Deco style and opened in 1930. 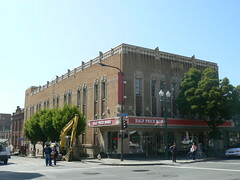 It is now an Historic Landmark on the United States Register of Historic Places. The school is beautifully decorated, especially around the main entrance and the side entrance on Bridger. 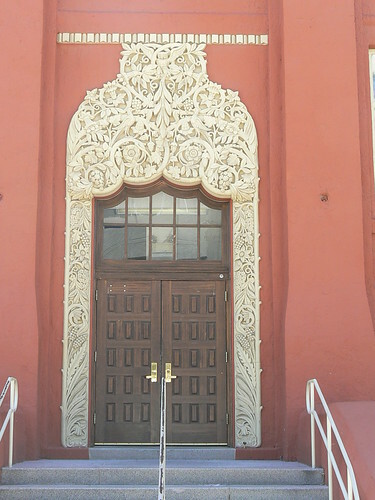 At the main entrance the decoration surrounding the door includes frogs, fish, birds, snakes, rabbits and cherub-like figures. 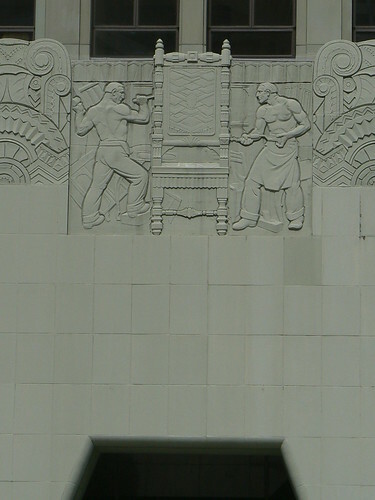 Above the door, the decoration includes two kneeling students and a grapevine. The other doorway, in my opinion, gives an overall impression of an owl although it is made up of intertwined vines and flowers. There are several birds perched on the limbs and right at the top an owl with its wings spread. Another interesting aspect of LVHS are the Senior Squares at the base of the main steps. 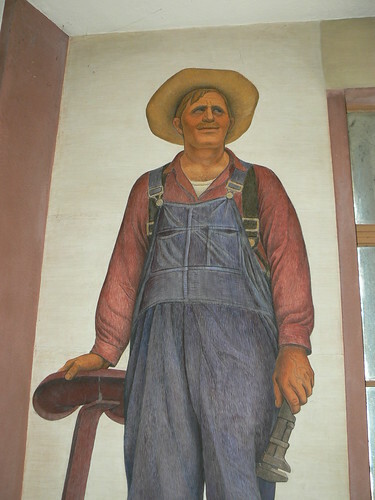 They were painted each year by the graduating senior class and are the subject of a recent restoration project. This house in Middle Park is a wonderful example of how older building can be re-used and adapted for a new purpose after they are no longer required as originally planned. 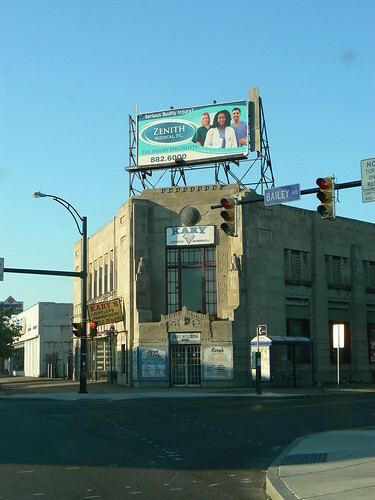 The white portions of this house providing the front entrance and ground floor facade were, in a former life, part of Morris Bros Union Dairy. To cater for modern living, the site has been excavated to provide a large garage and a second storey in a contrasting style has been added. This type of redevelopment appeals to me. 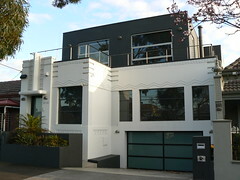 It is easy to see the extent of the original building and the Art Deco detailing has been retained in the new structure yet presumably the new owners have created a great home for themselves. The new house retains some of the history of the site and prompts observers to wonder what it was before. 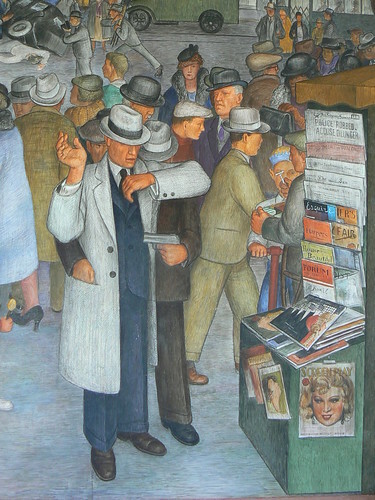 Another of the Art Deco shops in Chestnut St, Marina is San Francisco Optics. This corner shop has square columns at street level with green and rust (dare I saw International Organge) coloured tiles however the main decoration is above the level of the shop windows. 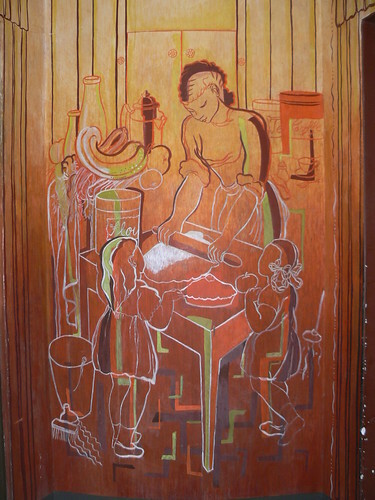 Here there a series of three horizontal lines with the top one presenting as a continuous band interrupted at regualr intervals by detailed Art Deco panels. 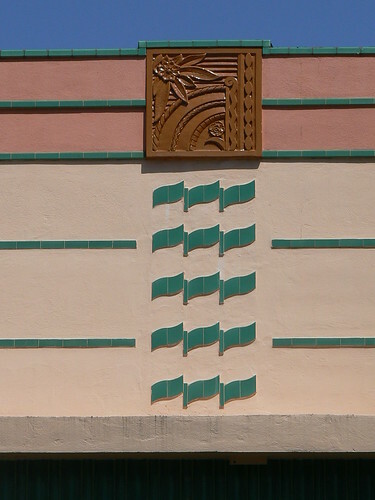 The lower two lines break at the corner of the building and for groupings of green wave motifs under each of the orange deco panels.